All meditative paths and wisdom traditions tell us to increase our light. That our own inner light will guide our way on. They say that life is joyous and a powerful gift and opportunity for fulfillment and co-creation. This workshop experience introduces the 4 stages to refine your inner light. The stages are Lucidity, Luminosity, Radiance and Brilliance. These are distinctive states and capacities we all have as a birthright to guide our way on. They are gateways to personal balance, healing, insight and the intuitive realms of spirit. Gurucharan guides us as a master of kundalini meditation with insight, humour and a passion to elevate our heart and the understanding of our potential. This workshop is for all levels of meditators and yogis – beginner to advanced. 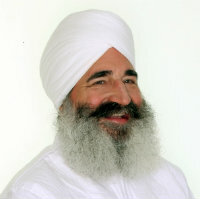 Gurucharan Singh Khalsa, Ph.D., is a clinical counselor and professor of contemplative science. He is a leader exploring the nature of consciousness and human potential using meditation and the insights of science. He was recognized by and worked with Yogi Bhajan as his Director of Training and founded the Kundalini Research Institute (KRI). His energetic, insightful and humorous presence delivers experiences that hit the heart and stay with your soul.